God is doing an awesome thing as he helps us memorize Romans 8! 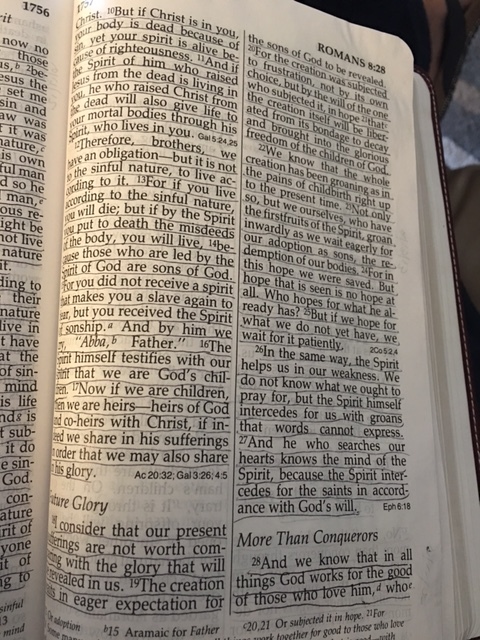 This is a long and difficult chapter to memorize but God is blessing our efforts as we repeat his words over and over and over. “Therefore, there is now no condemnation for those who are in Christ Jesus because, through Christ Jesus, the law of the Spirit of life set me free from the law of sin and death. For what the law was powerless to do in that it was weakened by the sinful nature, God did by sending his own son in the likeness of sinful man to be a sin sacrifice. And so he condemned sin in sinful man in order that the righteous requirements of the law be fully met in us who do not live according to the sinful nature but according to the spirit. 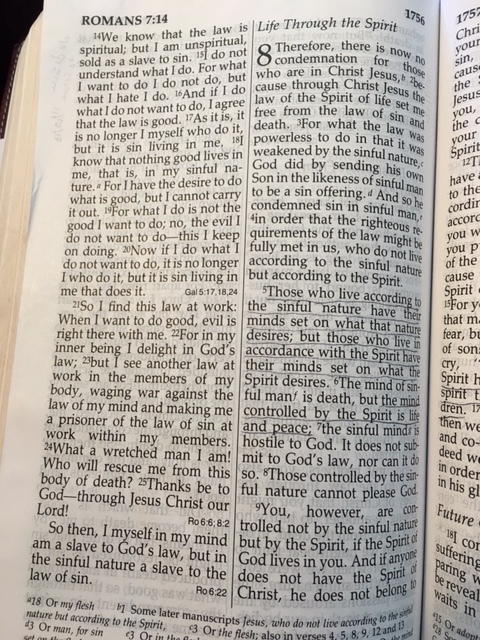 Those who live according to the sinful nature have their minds set on what nature desires but those who live in accordance with the spirit have their minds set on what the Spirit desires. The mind of sinful man is death but the mind controlled by the Spirit is life and peace. The sinful mind is hostile to God. It does not submit to God’s laws nor can it do so. When we have accepted Jesus as our Savior, his Spirit lives in us. He gives us an eternal, personal relationship with God. When we let him transform us, he gives us a new nature filled with grace and faith.